Crunching on my favorite Gingerbread Man cookies is only half of the fun. To really round off the fun, I like to have hot chocolate to go with it. Particularly with the temperatures dropping these days. Searching around for hot chocolate online options, I came across a little bundle called “Cocoa On The Go” for sharing out the fun with others. 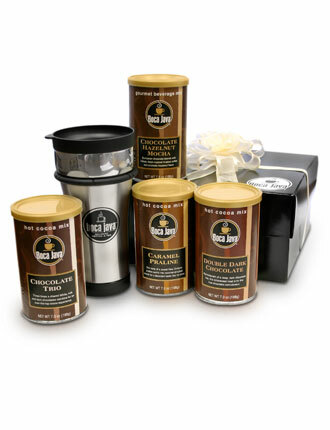 It’s a kit of a variety of hot chocolate drinks and a travel mug… all in a gift container. Sure sure… we ordered for ourselves too… it’s for testing before we buy others ones for gifts. OK, maybe it’s actually just an excuse to get more hot chocolate to go with the latest batch of Gingerbread Men coming out of the oven! From Boca Java: This is a great option for you. Try our extire assortment of delicious hot Cocoas, included in the gift is 7oz of our Trio chocolate cocoa, 7oz of our Caramel praline cocoa, 7oz of our chocolate hazelnut mocha, and 7oz of double chocolate cocoa. Take it with you in our fabulous stainless steel Timbolino travel mug.